Quickly visualize log volume, search results, and refine timeframes via an interactive chart. Visualize syslog and SNMP trap data as well as Apache logs from your infrastructure in real-time. Integrate the network data you’ve monitored and collected directly into the Orion Platform console to view alongside log data. SolarWinds® Log Manager for Orion® is designed to give you the capability to quickly visualize log volume, search results, and refine timeframes via an interactive chart. Since Log Manager is incorporated into the Orion Platform of products, you can seamlessly integrate the log data you’ve monitored and collected directly into the Orion Platform console to view it alongside other network and systems performance metrics. Unifying your log data and infrastructure performance helps provide a clearer view of your network’s performance. Your infrastructure continuously generates log data to provide performance insight. Being able to visualize and monitor syslog, SNMP traps, or Windows event logs in real-time helps give you the near-instantaneous insights you need for effective troubleshooting. Collect, consolidate, analyze, and visualize all your log information within one tool to help you uncover the root cause faster. SolarWinds Log Manager for Orion is designed to provide the log visualization you need to keep your network and business up. The best log monitoring tools should not only provide users with the capability to collect log data, but they should also effectively search, filter, and visualize these insights. Apart from aggregating and collecting monitored log data, Log Manager for Orion is designed to let you refine and filter log files via intuitive, out-of-the-box filters. 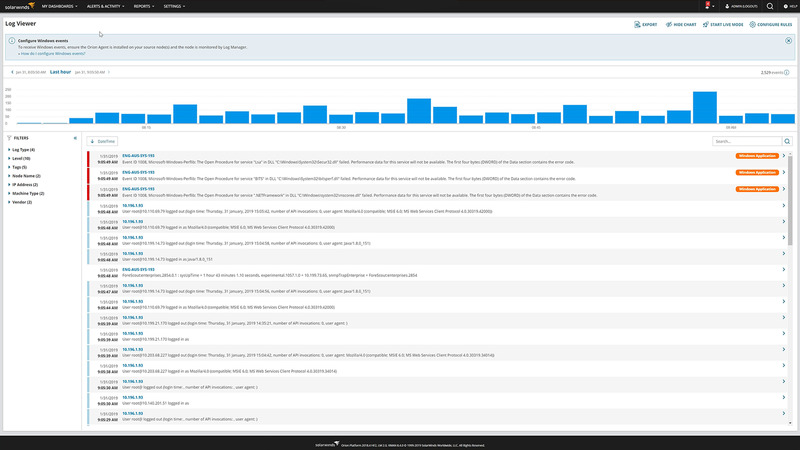 Using the powerful search engine that comes built in to Log Manager, you can quickly find the log entries of interest to visualize to aid you in troubleshooting that saves you time and effort. Without log file visualization, you limit network visibility and create missed troubleshooting opportunities that can lead to a slow network. Not detecting root cause can lead to slow mean-time-to-resolution, furthering network issues. By not visualizing log and performance data, you waste time and resources.